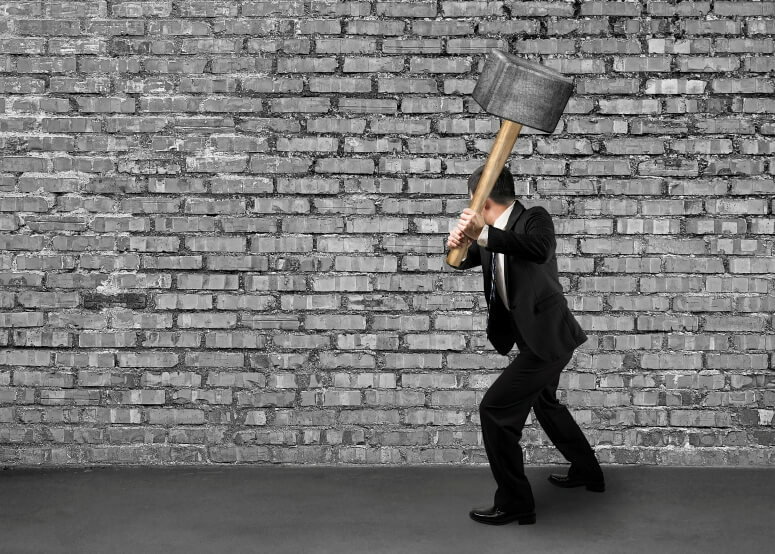 Let’s take a look at some of the top reasons that construction companies hit the wall with QuickBooks and discover they need industry-specific software to avoid inefficiency and shrinking profits. There’s nothing more frustrating than having to sort through a stack of change orders to make sure you’re doing the job the way it’s supposed to be done. In QuickBooks, you can develop estimates, but you can’t make significant changes to it without having to deal with database headaches, duplicate data entry, and potentially costly errors down the road. The most successful construction companies know that change orders are just par for the course and they’re sure to incorporate change order tracking functionality into their software. Do you know exactly how much that special-order doorknob and lockset cost? In QuickBooks, you can enter expenses but you can’t track the intricate details of your jobs, costs, and budgets. Dedicated construction accounting software provides detailed cost breakdowns for each job and for each component of the job. With built-in detailed job cost reports, you can even determine whether you’re losing money because of subs, material, or labor and exactly where things are over budget. No more guesswork. There’s nothing worse than having to deal with a problem or risk to your business because a subcontractor wasn’t properly insured or following the legal requirements of the job. Lack of controls and features for strict management of subcontractors is a big reason to switch away from QuickBooks. Because one subcontractor who isn’t insured to the right levels means you’re left holding the bag if something goes wrong. By having insurance tracking and subcontractor compliance features built into your accounting system, you can easily make certain that subcontractors are held accountable and even hold back payment if requirements are not met. At any given time, do you know how much of the job has been completed and how much work remains? With QuickBooks, most of this information is tracked outside of the software in spreadsheets and other disconnected systems – making it a bulky, unwieldy, and unreliable way to track work in progress. Sure, QuickBooks handles basic payroll. But more complex issues such as union wages, different taxes when you cross state lines, and certified payroll records aren’t challenges that QuickBooks handles well. Software that’s built for the construction industry offers payroll features that will track hours, ethnicity, social security numbers, work type, fringe benefits, and everything else you need to comply with state, local, and union payroll requirements. When it comes to construction, QuickBooks leaves plenty of gaps. Most companies fill those gaps with spreadsheets, hand-written notes, and other tools that are disconnected from QuickBooks. Information about your projects, costs, and operations are scattered and disconnected which makes it almost impossible to run a profitable business. With construction-specific software, things like estimating, project management, service management, equipment tracking, and time entry are all integrated into one powerful system. Your reports provide a “single source of truth” allowing you to make informed decisions and guide the business to the most profitable jobs. QuickBooks was probably great in the beginning, helping to get your company off the ground. But generic “off the shelf” accounting software will only take your business to a certain point before you run up against its limitations. For the construction industry, QuickBooks is a good example of one size fits many, but never really fits quite right. While the cost of industry-specific technology like Sage Construction Software is almost certain to be more than what you paid for QuickBooks, the return on your investment is many times greater in the form of efficiency, profitability, competitiveness, and a healthy growing business. If you’ve hit the wall with QuickBooks, it might be time to take a closer look at software that’s designed for your industry. Leave your name below and we’ll send you a copy of the QuickBooks vs. Sage Feature Comparison. 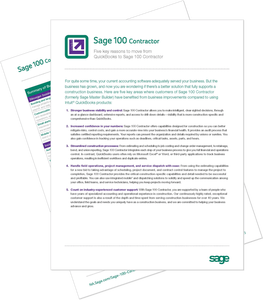 This document provides a detailed, side-by-side comparison of the benefits and capabilities of Sage Construction Software vs. QuickBooks.